It’s easy to be confused about what is healthy and what is not. There are so many experts out there telling us conflicting rules about what we should eat. 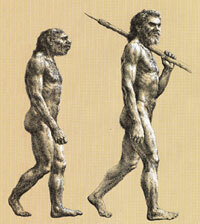 Erich Kuersten takes a humorous look at the implications of eating the Caveman Diet in Manhattan. Considering the genetic diversity of our species, I don’t believe there is one diet that works for everyone. I think you have to experiment and find what works for you. Next: Canned Pumpkin: Is It Real?